d i v e r s i t y w o m a n . c o m S p r i n g 2 0 1 8 D I V E R S I T Y W O M A N 37 Pricewaterhouse Coopers Gender equality is an economic and social imperative at PwC, which has a network of firms in 157 countries with more than 208,000 people. In the United States, 48 percent of PwC's 39,000 employees are women. Initiatives to help recruit, retain, develop, and advance women into leadership posi- tions include Women's Net- working Circles, Women Upfront, and Breakthrough Leadership program. Aspire to Lead, part of PwC's Women's Leadership Series, targets university students and pro- fessionals. It features an annual global video webcast with top female executives and runs leadership skills-building workshops year-round. Women's Networking Circles arrange regular meet- ings for small groups of employees to discuss career advance- ment using forums and educational materials, including videos from Facebook COO Sheryl Sandberg's LeanIn.org. PwC monitors its progress in terms of processes and human capital practices designed to identify women who are high po- tential and to ensure they have effectual coaching and sponsor- ship. "We think sponsorship is so important for our women," says Mike Dillon, PwC's chief diversity and inclusion officer and a member of the LGBT Partner Advisory Board. Take, for instance, Breakthrough Leadership, an intensive two-day leadership development experience for high-potential women and their partner sponsors. e women, with their spon- sors, explore ways to enhance their skills, negotiate work and family responsibilities, and gain greater visibility or exposure, says JENNIFER ALLYN, diversity strategy leader. US Chairman and Senior Partner Tim Ryan leads PwC's diversity efforts and encourages men to join the women's movement for parity. PwC is an IMPACT partner with the United Nations effort around HeForShe, an initiative that aims to mobilize 1 billion males in support of gender equality. DW Carolyn M. Brown is an award-winning journalist, author, and play- wright. She is the coauthor of the career book Climb: Taking Every Step with Conviction, Courage, and Calculated Risk to Achieve a riving Career and a Successful Life (Open Lens, May 2018). KPMG KPMG monitors the challenges women face to provide a clear path for high-potential talent to rise to the top. Women comprise nearly 50 percent of 189,000 employees at KMPG's financial audit, tax, and advisory services. e KPMG Women's Advisory Board (WAB) has been instrumental in proposing initiatives that enhance career opportunities. One of WAB's biggest successes is the KPMG Network of Women (KNOW). Developed by WAB and delivered by KNOW's local chapters, KPMG's Executive Leadership Institute for Women was established to move more women into C-suite positions. To date, the institute has graduated roughly 1,200 women executives from the yearlong leadership development program. "It was designed specifically for KPMG's women part- ners and senior managers, and their peers in the mar- ketplace," says Chief Diversity Officer SUE TOWNSEN. "e program equips participants with the practical skills needed to develop as leaders while providing the opportunity to build strong relationships through co- horts." 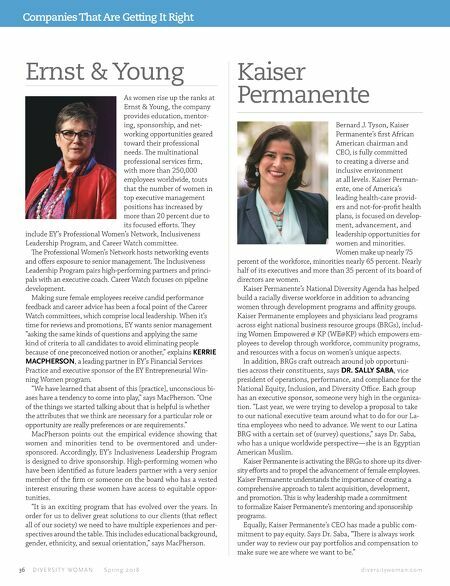 Townsen, who chairs KPMG's national Inclusion and Diversity Executive Council, works alongside US Chair and CEO Lynne Doughtie. 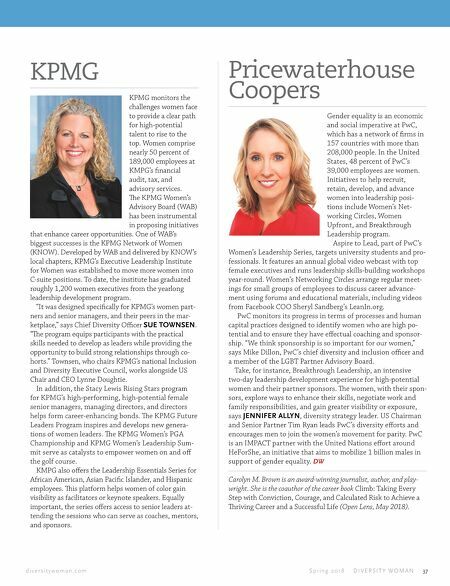 In addition, the Stacy Lewis Rising Stars program for KPMG's high-performing, high-potential female senior managers, managing directors, and directors helps form career-enhancing bonds. e KPMG Future Leaders Program inspires and develops new genera- tions of women leaders. e KPMG Women's PGA Championship and KPMG Women's Leadership Sum- mit serve as catalysts to empower women on and off the golf course. KMPG also offers the Leadership Essentials Series for African American, Asian Pacific Islander, and Hispanic employees. is platform helps women of color gain visibility as facilitators or keynote speakers. Equally important, the series offers access to senior leaders at- tending the sessions who can serve as coaches, mentors, and sponsors.